Single controller, electronic components, modules, crystal oszilator (quartz), female connector, multi-pin connector, etc. 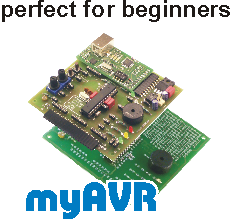 which are used with myMCU products, are here available for low cost as additon of these products or to complete your own circuits. 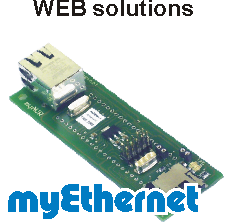 The EEPROM, suitable for the myTWI EEPROM. The real time clock, suitable for the myTWI real time clock. Complete painted temperature sensor on DIP8 with condenser, suitable for the myTWI temperature sensor. AVR-RISC-Controller in DIP housing. The 8 K version of the ATmegaX8 series. AVR-RISC-Controller in DIP housing. The 16 K version of the ATmegaX8 series. AVR-RISC-Controller in DIP housing. The 32 K version of the ATmegaX8 series. The quartz, suitable for the myTWI real time clock. The adapted quartz to the ATmega8. The quartz 7,3728 MHz is particularly suitable for an exact timing and to define an exact baudrate for the UART communication. The fastest quartz for the ATmega8A. The adapted quartz e.g. for the ATmega8. The adapted quartz e.g. for the ATmega48, ATmega88 and ATmega168. To plug on microcontrollers. Suitable for the ATmega8. Skirting board 20 pole, single-row. Skirting board 8 pole, single-row. 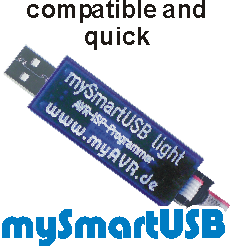 Female connector, suitable for the mySmartUSB. Multi-pin connector, suitable for the mySmartUSB. The multi-pin connector is suitable for the myAVR Board. The lithium battery is suitable for the myTWI real time clock. The battery holder is suitable for the lithium battery, 20 mm.